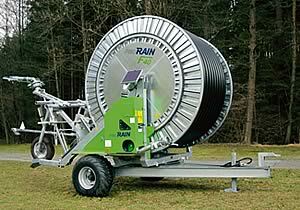 Growers wanting an efficient and durable reel irrigator now have a new option in the shape of the ProRain irrigator. The Bauer ProRain reel irrigator comes in two models with a choice of six hose diameter/hose length configurations to suit different applications. The ProRain comes in two sizes covering many of the popular hose configurations preferred by UK growers and can be quickly adapted to cover a wide range of water flow rates and rain gun sizes. Key features include a self-loading rain gun trolley for rapid moves; hydraulic stabiliser leg operation; optional hydraulic turntable rotation; and a fully galvanized finish for components needing corrosion protection. The design of the ProRain is based on retraction forces that are a little lower than those of the Rainstar but still higher than competitor machines. Also, the drive unit, which consists of a water turbine/gearbox combination, is an efficient unit providing enough power to cover the standard performance range for different application rates. Field experience suggests the ProRain’s turbine maintains efficiency over a wide range of flow rates. But Bauer has, nonetheless, made it as easy as possible to change injection cones to cater for a wide range of water flows. The reel is constructed with a closed inner drum to ensure that the first layer of hose sits correctly without distortion or overlapping. That way, subsequent layers will build up evenly. In work, the ProRain is operated using Bauer’s Ecostar 4000S controller powered by a 12v battery with solar panel charging. In addition to irrigation stop/start, the Ecostar is used to set the hose retraction speed, which is displayed on a read-out. The display also shows the time remaining until the end of the run and the length of pipe deployed – a measurement calculated using sensors on the drive gearbox rather than the pipe to avoid errors caused by soil and other debris. Individual water-testing of every ProRain irrigator that leaves the Bauer factory is another measure of the Austrian manufacturer’s attention to detail and something that Norfolk dealer Tony Freezer of AJ Freezer Water Services, Swaffham, really appreciates. At around £18,300 for a base-spec F40 110mm/500m, he also reckons the ProRain represents good value for money. “It’s competitively priced but not built down to a price,” he maintains.